In Germany, many schools are named after the Scholl siblings, and there is a good reason. Sophie and Hans Scholl were resisters. They authored and distributed leaflets against the Hitler regime and the war, and gave their lives for freedom. Their resistance group, the White Rose (‘Weiße Rose’), was made up of students from the University of Munich. While there also were resisters who tried to kill Adolf Hitler or other high-ranking officials in Nazi Germany, the Scholls and their fellow campaigners concentrated on getting the word out, the word against Nazi terror, and yes, the word for freedom. In 1943, Hans Scholl was 24, his sister Sophie 21. Hans had been part of Hitler’s youth organization. Over the years, they learned what was really going on at the front lines. At some point, they heard of systematic murder in concentration camps. In one of their leaflets they said Hitler had deceived the German people. The tyranny in the Reich was unacceptable and the worst the German people had ever been confronted with. It was time to resist. The original indictment against Sophie and Hans Scholl, as well as their friend Christoph Probst, was supposedly lost after the war. Only after the German reunification, in 1990, it was found in the GDR’s notorious State Security Service’s archives. It reads the accused had called upon the Germans to sabotage weaponry and “our National Socialist way of life”. Also they had insulted the ‘Führer’. This description of the White Rose’s activities was even accurate. In six leaflets, they attacked the Hitler regime from an intellectual point of view. The resistance group also commented on the defeat in Stalingrad, which had been a foregone conclusion. The latter happened after Hans Scholl and his friend Alexander Schmorell, who was also part of the White Rose, returned from the eastern front. The draft for their seventh and last leaflet was written by Christoph Probst. The Nazis found out about this easily, also because the draft was written in his handwriting. Seventy-five and a half years ago, on February 18th, 1943, Sophie and Hans Scholl were caught distributing hundreds of copies of one of their leaflets at the University of Munich, by caretaker Jakob Schmid. He told the Gestapo. As a result, Sophie and Hans were arrested. Only four days later, on February 22nd, 1943, the notorious Nazi judge Roland Freisler convicted and sentenced them to death. Both were decapitated under the guillotine that same day, along with Christoph Probst. The Scholls had about 10 minutes to say goodbye to their parents, who had rushed to see them in Munich. According to Inge Scholl, Hans’ and Sophie’s sister, they and their parents agreed that the execution would harm the regime further. “After the farewell, they left the room without fear. They were calm and imbued with deep enthusiasm”, the sister wrote. Sophie School seemed to be the one who was not frightened a bit. The Scholl siblings were not the only Germans who fought the Nazi regime. But they were among the few freedom fighters who risked everything, since they knew the war, the injustice, the murder and genocide spread and pursued by the German regime needed to be stopped. To them it was a question of conscience. Jakob Schmid, the man who denunciated the Scholl siblings, was arrested by the American liberators in 1946, and sentenced to five year in prison. Today, there are not just many ‘Geschwister Scholl Schulen’ (Scholl Siblings Schools) all over Germany, but also faculties which carry their name, as well as memorials, including a Plaque at the University of Munich. Many streets and squares were named after them too. Three German movies tell the Scholl’s story, including ‘Sophie Scholl – Die letzten Tage’ (‘Sophie Scholl – The Last Days’). This motion picture received a prize at the Berlinale, and it was nominated for an Academy Award. After Hans, Sophie and Christoph were murdered by the Nazi regime, the content of White Rose leaflets were reprinted by the British. Thousands of copies were dropped over the Reich from planes belonging to the Royal Air Force. Many more Germans now had the opportunity to read what the Scholls and their comrades had written. As a co-founder of the White Rose and one of the two main authors of its leaflets, Hans Scholl had a lot of influence. His path from a strong supporter of the Nazis to one of their most important adversaries was distinctive. Against the will of his father, Hans Scholl not only became part of the Hitler Youth, but he assumed a leading position in its sub-organization ‘Jungvolk’. In October of 1933, he became part of the ‘Ulmer Jungvolk’, a group which sang different songs, compared to the Hitler Youth, and had a different flag. Hans lead a group of ten boys. Because of his activities in that organization, and due to an alleged homosexual relationship, he was incarcerated along with his siblings Sopie, Inge and Werner in 1937, but it did not last long. Proceedings against Hans Scholl were discontinued after an amnesty in 1938. Even while taking part in big events organized by Hitler’s party NSDAP, his opinion about the Berlin regime started to change. In the spring of 1939, Hans Scholl started his medicine studies at Munich University and continued becoming more critical of what was going on around him. At the same time his religion became more important to him. In letters, he wrote his days had become brighter and brighter, while he was praying. What Hans Scholl saw on his way to his deployment at the eastern front, including the treatment of the Jews in the Warsaw Ghetto, radicalized him further. The texts he wrote for the White Rose leaflets reflected his anger and conviction according to which the Hitler regime needed to be fought and removed. Hans and Sophie Scholl are buried at the cemetery at the ‘Perlacher Forst’ in Munich. Their grave, number 73-1-18/19, is marked by a double Christian cross which carries their names. 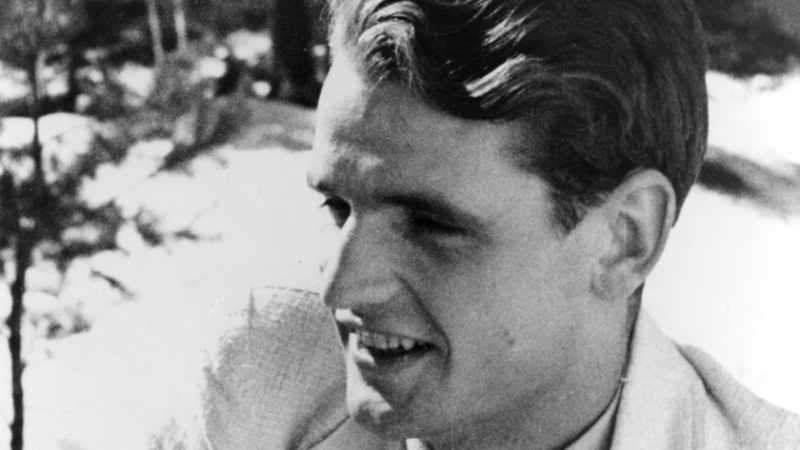 Today, Hans Scholl, who was born on September 22nd, 1918, would have been 100 years old.